Welcome to the charming village of Comabbio located about 50 km of Milan, 25 minutes drive from Malpensa Airport. In less than 1 hour you can reach the center of Milan and a lot of pleasant destinations for your holidays. The 4 bedrooms (9 beds/places overall) of Villa dei Laghi welcomes you with its well maintened property, included the garden (about 1 hectar). Feel free to relax in our comfortable internal&external space. Guests have access to most spaces in the house and its spacious yard. Full furnished kitchen with dishwater and laundry room in the next bathroom . No dryer machine, we hang clothes on racks...in the sun! There is ample parking in front of the house. You find detailed instructions about waste collection and pickup. At the check- in, one person of the family offers you welcome food and beverages. In the house you will find a selection of brochures about the surrounding areas and we can help you in searching the places or activities you prefer (biking, swimming or simply exploring). When booking, please indicate if you need additional information in regards to recreation, culture, sport, events or other relaxing activities. 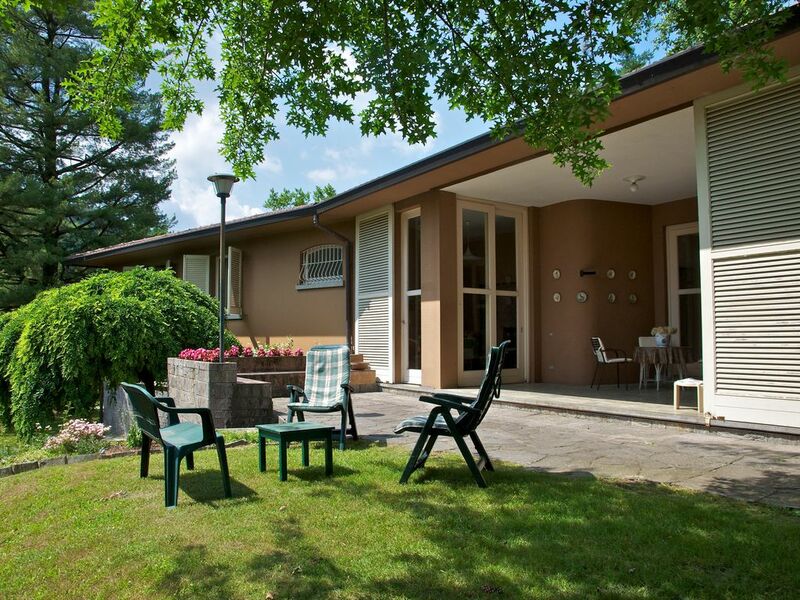 The house is a great base to explore the gorgeous scenario of one of the best Italy' s lake zone. In fact, the Villa is 30 minutes drive from Stresa/Borromeo Islands and very close to many lovely Lombardy lakes (Comabbio, Monate, Varese, Maggiore, Orta). From a walk distance you can reach the bycicle route around Lake of Comabbio (a circle of 10 km) and the connected Lake of Varese (30 km). Two kilometers away there is Lake of Monate, where you can swim from beach public access. Due to the few public transportation we recommend you to rent a car, so you can simplify your travel needs for shopping, dining and working. The Villa is part of a multiproperty family lot. If you are more than 1 group or family, in the park there is another Villa available. Feel free to ask for further informations. I live with my son and daughters in a big old country house, exactly how I like it. I also like to meet new people, that's why I arranged a part of it as a B&B. I love to spend some time in our family villa in Comabbio, to realx and take care of the amazing garden my parents built. I have worked with wood all my life and I won't stop now, I have to stay outdoor and do crafts. When I can't, I love to read books and get informed about the whole world. My parents built the villa and the surrounding garden. It's part of our family and our history, and it's full of good memories from our childhood, adolescence and adult life; slowly, our sons and nephews are creating their own sweet memories there. We want to keep our property because living in Comabbio is leaving behind all troubles and chaos from city life, from daily work and the office. It is waking up, having a coffee walking in the garden and then riding a bike to go swimming in the nearest lake. It is relaxing in the garden taking care of plants and flowers, looking at the kids playing or just laying on the grass. It is sitting in the porch reading a book avoiding junk tv programs. And if this is not enough, there's a whole new world waiting right out of the gate. The villa is still fascinating, even for us after 40 years. The fireplace in the cozy living room has a special scent, and it's a pleasure just to sit down and watch it crackling. The touching sight from the huge glazed doors showing the south part of the garden make you forget all businesses and troubles of the week. The colors of blooming plants all around make you feel in a painting. Thousands of lovely details are waiting visitors to discover them and to make your stay unforgettable. Telephone available, free national calls. International calls forbidden. Air-heating system, natural gas fueled, regulated by a thermostat. Sheets, pillowcases and blankets furnished. Private washing machine in the bathroom near the kitchen. Soap furnished. Fireplace inside the living room. Firewood available. Outdoor parking spots inside the property: 1 caravan/camping van spot without services, 4 car spots. The garage is pertaining to the villa with internal and external access, 1 available car spot. ADSL Wi-fi connection available in the studio, the porch and the living room. Computer not included. Bath towels and beach towels furnished, as well as tableclothes. Big living room for 7 people, tea table, stereo and fireplace. Vertical fridge with a small freezer on top. Full set for at least 20 people including dishes, glasses and cutlery, different pans and pots with covers, full set of kitchen utensils. Four flames, electric hoven, sink, fridge, deep freezer, dishwasher, toaster, coffe machine, kettle, breakfast table. Dining room connected to the kitchen through a se4rving hatch. Big wooden table for 10 people. Cable tv. National channels available. DVD player available, no Blu-ray. Cards and board games for all ages. Synthetic tennis/football field shared with another property. Availability and rules by request. Not illuminated. Rackets and balls not available. Schönes, aber etwas in die Jahre gekommenes Haus (Ausstattung vermutl. aus den 60/70er Jahren / da nur ältere Klimaanlage und keine Heizung- eher etwas für der Sommer). Freundliche Vermieterin, unkomplizierte Kommunikation. Grazie per il vostro soggiorno e per la recensione. La casa è stata costruita da mio padre nel 1968 e io con fratelli sorelle e nipoti la usiamo molto. Nelle mezze stagioni e in estate dà il meglio, ma anche di inverno ha il suo fascino! Accueil par Pierra très bien. Madame Barrelli nous a bien rendu service lors de nos problèmes de panne de véhicule. Nous étions 9 à l'aise .Bonne literie, sallon spacieux seul bémol la machine à laver était en panne. La casa è perfetta per un gruppo di amici o una famiglia medio-grande. Stile anni '70, ha un bellissimo giardino e un magnifico camino in soggiorno che si presta alla vita conviviale. Se avremo occasione ci torneremo sicuramente. We waren met vijf volwassenen en drie kinderen, en hadden alle ruimte, zowel in als om het huis in de reusachtige tuin. Prima bedden, alles wat we nodig hadden was aanwezig, en het weer werkte ook nog mee. Fijne vakantieweek! Nous étions 4 couples. Très belle maison confortable, propre et bien équipée. Nous n'avons manqué de rien. La literie est bonne. Les chambres sont grandes et deux salles de bains parfaites. La troisième qui sert de buanderie un peu moins mais elle a nous a bien dépannés. Le séjour est grand, largement ouvert sur le magnifique et grand jardin avec des arbres plus que centenaires. Madame Barilli a répondu chaleureusement à toutes nos questions (en français) et à notre arrivée nous avons été très bien accueillis, le chauffage était en marche et la maison douillette. La région est belle et la maison idéalement située pour nos visites. In addition to the amazing sights, there is plenty of different bike and mountain bike itineraries all around, along which is possibile to enjoy most of the breathtaking shores of Lake Maggiore and Lake of Como. Tourists can rent a motorboat, a sailing boat or jump on a ferry for a nice ride on the Lake Maggiore, as well as they can rent a rowboat or a windsurf to explore the smaller Lake of Monate. For shopping addicts there's a huge commercial complex in Castelletto Ticino just a few kms far from Comabbio, while nature lovers can visit the National Park Val Grande for hiking and trekking. The same Castelletto Ticino has a nice outdoor karting track available for races or just fun. Minimo 2 giorni tra la fine di un soggiorno e l'inizio del seguente. Prenotazione minimo 3 giorni prima dell'inizio del soggiorno.